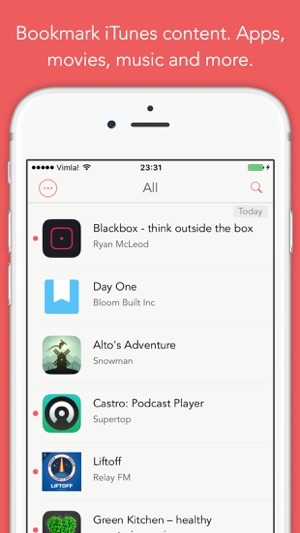 Lookmark is a smart way to bookmark iTunes content. Apps, movies, music, books and more - all can be bookmarked from your phone or computer. Use the Lookmark share extension in Safari or other apps such as the App Store. Don’t waste your data by downloading iTunes content over a cellular network. 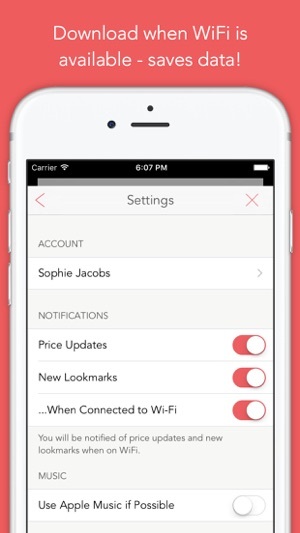 Lookmark notifies you when Wi-Fi is available. 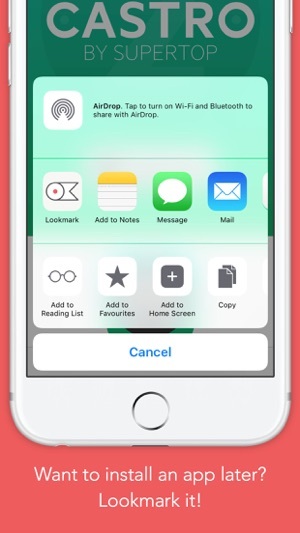 The Lookmark browser extension lets you bookmark iTunes content from web pages and sends it straight to your iOS device. 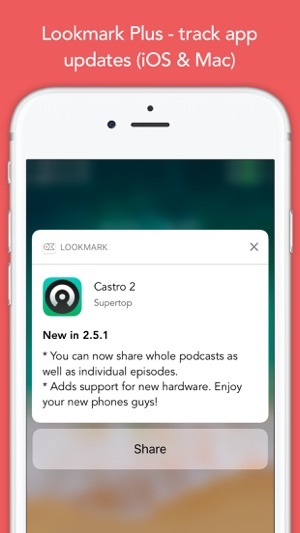 With a Lookmark Plus subscription you can be notified of prices changes for all content and app updates in the App Store or the Mac App Store. • All Content - Free for one month, then $19.99 per year. 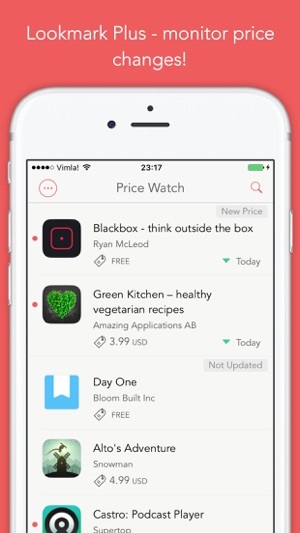 • Apps Only - Free for one month, then $13.99 per year. Lookmark Plus will automatically renew within 24 hours before the subscription expires. Your iTunes account will be charged. If you purchase a new subscription during a free trial, any free trial period remaining will be forfeited. You can manage your subscription and turn off auto-renewal in Account Settings. Improvements and small bug fixes. This is a decent wishlist app it does the basic functions of a wishlist. It needs more options especially sorting options the only option to sort is by date added to the wishlist. It would be nice to have a sort by name, category, price low high, oldest and newest. What brings it down to two stars is the price. $14 a year is high, at most this is a one time purchase maybe $10 at the most or a few dollars a year. I'm not exactly sure what the subscription is needed? Weather apps need to pay dark sky, weather underground, etc every time someone uses this app. Video apps it cost them alot of money to maintain servers and content. This app as far as I can tell doesn't have any of these issues or servers to maintain or API cost to access the app store hence no monthly or yearly cost to the developer so this should be a one time purchase or one time IAP to unlock all features. I hope you reconsider your payment options here because I would really like to pay you for your effort and use this app at it's full potential however the subscription model is the wrong choice for Lookmark I hope you reconsider so you can make some more money. Myself and others based on the reviews would pay a one time purchase. Best of luck keep up the good work. Thanks for the feedback! Regarding the subscription: Lookmark has recurring costs for servers (used to keep/sync your content and to monitor and notify users of app updates and price changes), external services, and costs for product development. Since apps are expected to be constantly updated, in most cases a subscription based model is the only sustainable way to go. This is the first negative review I’ve ever written for an app. Do not download at any cost. I was an early adopter and long-time user. Recently they switched to a subscription payment model, which is bad enough and indicative of the culture of greed that has ruined this app—this app performs one function with very few updates, no call whatsoever for a recurring subscription fee. And if that weren’t bad enough when they switched over to the subscription model they also deleted all of my bookmarks, dozens of them, and wiped the slate clean. Lost everything. All so they could try to charge me in subscription what I had already been using for a long time. It’s a disgusting way to treat your users and there are plenty of other bookmarking apps out there I encourage you to download. For my part I will keep this app for the sole purpose of reposting this negative review for every single release from now through perpetuity, as they will undoubtedly bury the many negative reviews and ratings as often as possible. Hi! I'm sorry you feel this way, although I think your accusations are unfair. If you're a long-time user that means you also have created a user account. Your content should be sitting on our servers and you should be able to access it using your credentials. If that doesn't work for you, feel free to send us an email at feedback@lookmark.io (there's a link in the app) and we'll try to fix it. I don't understand what you mean by "...what I had already been using for a long time"? Did you already have a subscription but weren't able to access the Plus features? Again, please contact us if you are having problems and we'll figure it out. However, the thing you seem to be most unhappy with is the subscription model. I suppose you think all apps should just be free, but that's not possible for apps that have no funding and plan to stick around for a long time. I'm working very hard and without pay to keep this service running. I've released 28 updates the last 28 months, of which 3 this year. That may not be a lot to you, but it keeps me busy :-) Please contact me and we'll try to fix whatever issues you are having.